Spy wacky works of art, traveling exhibitions and more from an institution that draws from traditions of fine, folk, and public art at the Art Car Museum. 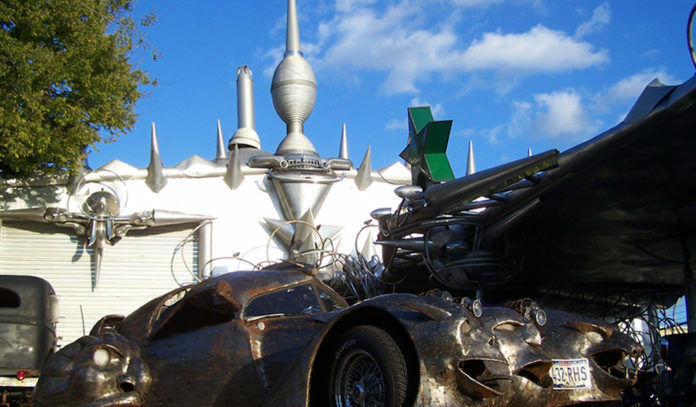 Housed in a building with a distinctive scrap metal and chrome, castle-like exterior in the Heights near Washington Avenue, viewers are given an imaginative indication of the extraordinary constructions that are waiting to be found inside. Once inside, visitors will discover a white-wall gallery showroom that celebrates the spirit of our post-modern age of car-culture with remolded stock cars, lowriders, and mobile contraptions set to the specifications of each artist’s respective vision. 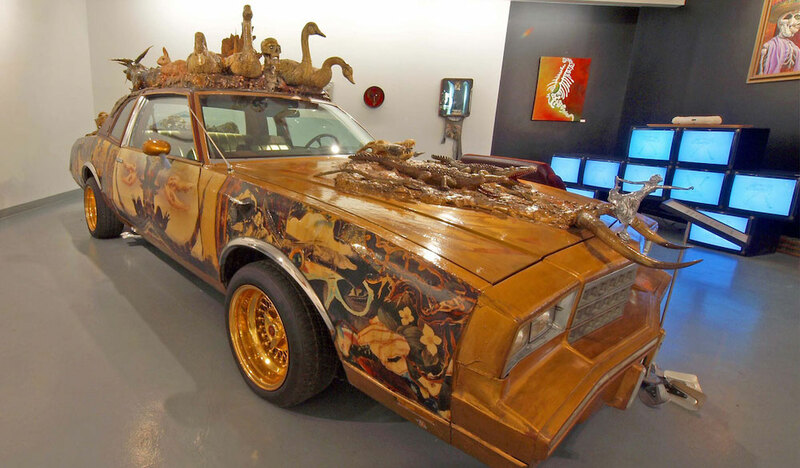 An exhibition forum for local, national, and international artists of all media, the free-to-attend museum places an emphasis on art cars, fine arts, and artists that are rarely acknowledged by other cultural institutions with revolving exhibitions. Opened in February 1988, the Art Car Museum, or “Garage Mahal” as many know it, was founded as a not-for-profit arts organization by Ann Harithas, artist and long-time supporter of the Art Car movement, and James Harithas, the current director of the Station Museum of Contemporary Art. Today, visitors will find vehicles transformed from mere factory-made commodity into personal expressions, including a ride with bronze taxidermy, a creepy roach mobile, a ride from the ’50s decked out in a floral pattern, a Christmas rocket, a giant Easter bunny on wheels, classic cars and more creations you just have to see in person to believe. Click here for a full list of upcoming events and exhibitions. In 1987, the Houston International Festival, the City’s official celebration of the arts, asked the Orange Show to organize a parade to build on the success of the New Music Parade. The Orange Show agreed to produce an event dedicated to art cars. Today, the annual Art Car Parade is the highlight of the three-day Art Car Weekend where 250+ jaw-dropping cars, bikes, skaters, and motorized creatures from all over the US, Canada, and Mexico roll along Smith Street in Downtown for a yearly audience of more than 250,000 spectators. The beauty of the parade is thought to be that it is just as likely for an entry to be made by members of the general public as by recognized artists. Admission: No cover. Click here for a complete list of information.